In order to enjoy the many adventures on the mountain (hiking, climbing, caves. 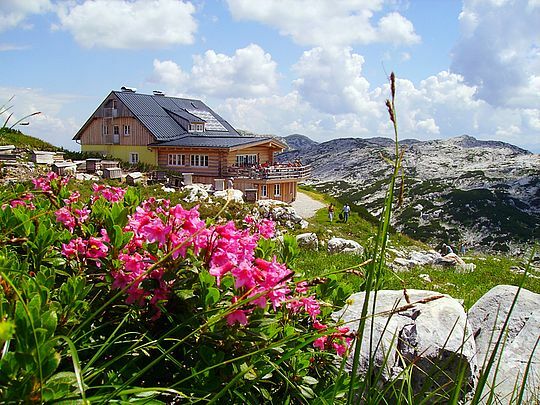 relaxing and much more) at the Dachstein Krippenstein longer, the lodges and huts invite guets to spend their summer holiday (and during multi-day mountain tours) in the lovingly furnished rooms and beds. And who likes to sleep directly with a view of the starry sky can also camp on the mountain (Gjaid Alm). And if it has always been your greatest wish to enjoy the morning silence at the sunrise on the mountain with a delicious breakfast and marvel at the unobstructed view of the nightly Milky Way, then book your accommodation directly in the lodges and mountain huts. A wide range of accommodation for your summer holiday in the Austrian mountains can be found at the booking portal of the Tourism Dachstein Salzkammergut - from the hotel to the youth hostel, there is the right offer for every taste.